You are here: Home > Blog > Do you know how a diaphragm pump works? Do you know how a diaphragm pump works? pressure (a hydraulic system using oil) to drive the pump. During the upstroke or intake stroke, the diaphragm is pulled up, creating a partial vacuum within the paint chamber. The vacuum pulls the inlet valve open and the outlet valve is pushed closed by the spring and paint pressure in the hose. Paint is then drawn into the paint chamber. On the down-stroke or pressure stroke,the inlet valve is closed and the outlet valve is forced open as paint is discharged to the sprayer hose and airless spray gun. Diaphragm pumps have a relatively small displacement volume. but The airless diaphragm pump must run fast (about 1725 cycles per minute) to deliver a steady flow of coating material. So the advantage for a airless diaphragm pump sprayer is the stable pressure during spraying, no vibration, no pressure drop down. The stable pressure would generate the equal atomization and even finish. 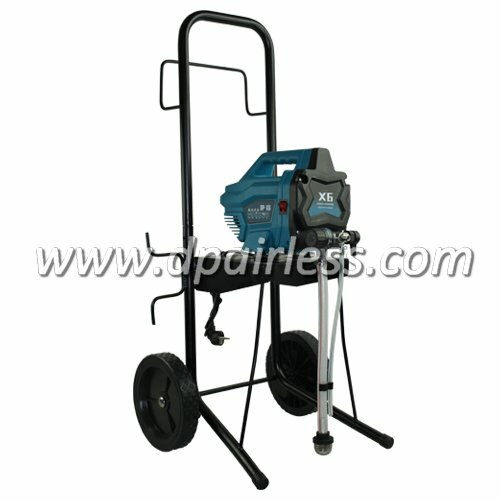 Compare to piston pump paint sprayer, the diaphragm pump has better spraying performance. But the painter doesn’t like it because it sometimes couldn’t draw up the heavy paint, (they have to dilute the paint before spraying). But for thin paint, it is a perfect paint spray tool! What is the advantages of the DC motor on airless paint sprayer? What Causes Airless Paint Sprayer Tails?